The Matrix Trilogy is now available in a definitive three disc Blu-Ray set. Featuring all three films together for the first time in stunning High-Definition, with a newly re-mastered picture and sound for 'The Matrix'. This box set also includes the companion piece 'The Matrix Revisited', two new audio commentaries on each film, 'Enter the Matrix' video game footage, deep-delving featurettes/documentaries, and much more! The Everyday World is Real. Reality: That World is a hoax, an elaborate deception spun by all-powerful machines of artificial intelligence that control us. In this final explosive third installment of the Matrix trilogy, the city of Zion, last bastion of the human race, defends itself against the massive invasion of the machines as Neo attempts to fulfill his prophecy as 'The One'. As the Machine Army wages devastation on Zion, its citizens mount an aggressive defense - but can they stave off the relentless swarm of Sentinels long enough for Neo, adrift in a no man's land between the Matrix and the Machine world, to harness the full extent of his powers and end the war? 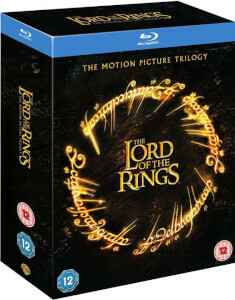 Has been 1 0f my favourite trilogy sets and to convert to Blue Ray just makes it all the more better! boxset arrived well within estimated time and in perfect condition! The collection comes in a thin cardboard sleeve of average quality. The design and overall appearance suit the films, but there is simply nothing special about it. The sleeve has a matte finish. Apart from that everything is as you would expect. If you are a fan of the films, it is worth the money, just do not expect to be blown away by any part of the packaging. Arrived promptly and in somewhat secure packaging. An amazing movie, as we all know. The box set is lite but its worth the price !! One of the best trilogies ever made. The first film especially is absolutely iconic and in HD it looks amazing. Loved these films as a teenager and they haven't disappointed me now, well worth the money you spend on then however I did feel like there wouldn't be much difference between the Blu-Ray and DVD editions, as I've said they do everything they are meant to and well worth the cost. Great box with subtitles in Frenxh language for me. Quality and bonus are Ok for this classic of science fiction. Thanks zavvi !